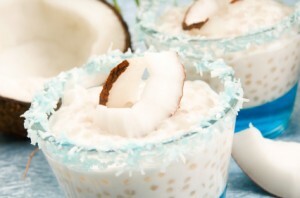 Soak small pearl tapioca in 1.5 cups of water in a saucepan for 15-30 minutes. Separate egg yolks from egg whites into two different bowls. Lightly beat egg yolks. Add coconut milk, salt, vanilla, lightly beaten egg yolks to the saucepan and stir over medium heat until it is boiling. Turn down heat to low and continue to stir every few minutes for 15 minutes. Add egg whites and stir for 3 more minutes on medium heat. Turn off heat. Add honey and mix. Let cool.